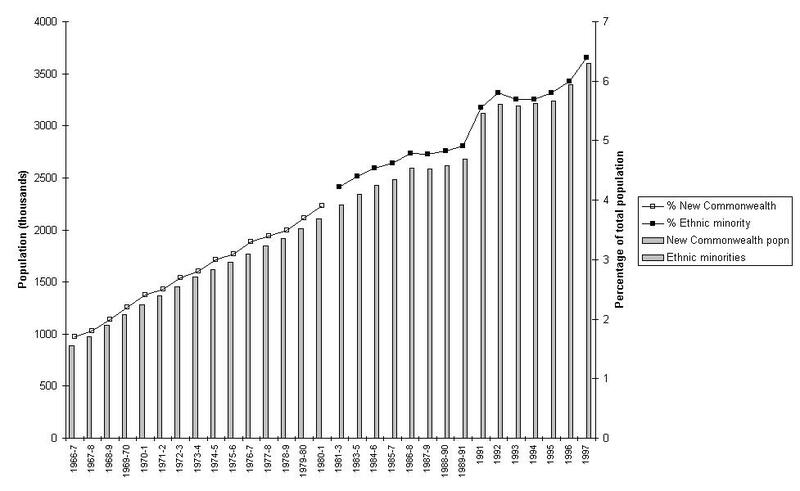 This diagram presents the trend in official estimates of the minority ethnic group population of Great Britain over the 30 year period 1967/8 to 1997, in terms of numbers of people and the percentage of the resident population. These were based on Census data on persons born in the New Commonwealth and Pakistan, updated using annual birth and death data, until 1981. After that date, they were based on Labour Force Survey estimates of the number of people from minority ethnic groups. The figure for 1991 is taken from the 1991 Census of Population, scaled to match the ONS estimate of the GB population at June 30th 1991 (this corrects for the Census undercount). This is a JPEG format graphic, which you can view at a larger size using your browser (e.g. click on the right hand mouse button in Netscape). Source: Various articles in Population Trends (a periodical published by the Office for National Statistics) on "the New Commonwealth population of Great Britain" and "the ethnic minority population of Great Britain". This page last updated: 8th July 1999.